Note: This resource does not offer downloading. Conflicts are categorized as High, Medium, and Low Intensity. Includes current and past conflicts (back to 1997). Provides a historical overview of each conflict, military and political developments, by year. Includes a list of External Sources, including relevant official documents, UN Resolutions and other sources, by conflict. A section on non-State Armed Groups, organized alphabetically and by region. Need to talk to someone to help you learn more about the data resources available to you in the social sciences? Drop by Uris Library Rm 102A behind the Consultation Services desk on Thursday mornings from 9am to 12noon to chat with Michelle Edwards from CISER. Walk-ins welcome or email Michelle at ame87@cornell.edu to make an appointment. 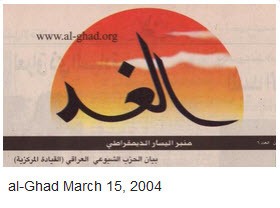 “… In the months following the U.S. invasion of Iraq in 2003, a flood of new newspaper titles hit the Iraqi streets, published by various political parties and institutions such as the Organization for Fayli Kurds, the Political Prisoners’ Organization, the Democratic Reform Party, etc. The titles included in this project provide a snapshot of the transformations and transitions taking place in Iraq at the time. Many of the titles have since ceased publication.” For more information about this microfilm collection, see the Center for Research Libraries. Microfilm and other CRL holdings may be requested via Interlibrary Loan. Search by polling organizations, including universities,newspapers, television news, Internet polling groups, and special-interest groups. Ability to narrow a search to the specific wording used, and to track questions over time. For more global opinion surveys, see: International Surveys and Opinion Polls . *The library has purchased a number of these collections and continues to buy additional collections, as-needed. The database ranges from the years immediately following World War II, when declassified documents were first made widely available, through 1992 (as of 11/22/2011). Select Foreign Relations of the United States (FRUS) from the Hein Online Library. Next, select the Search tab. You can select the “Field Search” to restrict your search to the title field or to combine title and full-text searches. Researchers can explore methods concepts, understand particular methods or identify a new method. Since SAGE Research Methods focuses on methodology rather than disciplines, it can be used across the social sciences. Includes methods cases, journal articles on methods, and much more, providing a comprehensive picture of research methods (quantitative, qualitative and mixed methods) across the social and behavioural sciences. The journal Impact Factor is the average number of times articles from the journal published in the past two years have been cited in the JCR year. The 5-year journal Impact Factor is the average number of times articles from the journal published in the past five years have been cited in the JCR year. It is caclulated by dividing the number of citations in the JCR year by the total number of articles published in the five previous years. Select JCR Social Sciences Edition and View a Group of Journals by Subject Category option. After submitting the subject category, for example, Political Science, sort journals by Impact Factor. New library website on the way! Upcoming changes to the library website, happening on July 1st. Please be assured that the Classic Catalog, and the e-journals list, will still be there. They are actually fairly easy to spot (after blinking twice). Links to the new catalog and the e-journals list appear just below the search window. The Classic Catalog will appear as a link from the new catalog. It is not there yet, but it will be by the time we go live, on July 1st. This new catalog will eventually include all the functionality of the Classic Catalog, but until it does, we will continue to provide easy access to the Classic Catalog. The new discovery system will also provide access to books, articles, databases and more, from a single-search. We hope that this will help our students discovery rich new resources for their research. Legislative Explorer is an interactive visualization that allows anyone to explore actual patterns of lawmaking in Congress, compare bills and resolutions introduced by Senators and Representatives and follow their progress from the beginning to the end of a two year Congress. You can filter by topic, type of legislation, chamber, party, member, or even search for a specific bill.